Isn't it fun to discover a whole new author just waiting to thrill you? I had this experience the other day digging into my very first Mary Roberts Rinehart book. I'd heard of her before, but I'll be honest with you: my expectations weren't particularly high. Consequently, When a Man Marries, an outrageous vintage farce, was a very pleasant surprise. Kit McNair may have refused to marry Jimmy Wilson back when he was an unattached bachelor, but she still considers him a close friend, and when she finds him in the dumps on the second anniversary of his wife's departure, she determines that what he needs to cheer him up is a dinner party. Things go quickly awry, however, when Jimmy's rich aunt arrives in town expecting to find him still married. Kit agrees to impersonate the missing Mrs Wilson, but an evening's deception quickly turns into an intricate imbroglio when a case of smallpox results in the whole dinner party being quarantined on the premises. Add police and reporters watching the house for escapees, Jimmy's ex-wife Bella lurking in the basement, a jewel theft to solve, the irascible Aunt Selina to hoodwink, and the love of Kit's life choosing to turn up at the exact moment she's impersonating someone else's wife, and When a Man Marries has all the ingredients for a classic screwball comedy. This book was, quite frankly, a party. I say this with full cognizance of its shortcomings. This was not a deep book, or a very tightly-plotted one. There's a little harmless satire at the expense of the socialites who, quarantined after the servants have fled, find themselves almost completely incapable of surviving without them; but eventually I felt this theme was dropped and never really resolved. The jewel thefts, too, turn out to have a rather off-the-wall solution, and sometimes Kit doesn't even seem to be trying to keep up her impersonation of Bella. Suffice it to say that if you are the kind of person to whom the internal logic of a story world is immensely important, this book will probably drive you crackers. That said, I don't think I've ever noticed a book's flaws less while reading it. Rinehart writes with a splendid comic sensibility, inventing ridiculous situations almost as handily as PG Wodehouse at the top of his form. Her style, and the narrator voice, was also a delight--witty and knowing and constantly teasing us with unspecified awfulnesses lurking in the future. From the moment I looked at the first page, I knew I was in for a treat. If you're in the mood for a fluffy, silly comic read, then give this book a try. I'll certainly be trying another Rinehart next time I am! 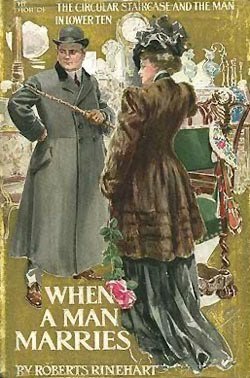 Find When a Man Marries on Project Gutenberg, Librivox, The Book Depository, or Amazon. Last month, I spent a few weeks in Tasmania, on assignment in a house full of little girls. As you might imagine, this involved proportionately large quantities of dolls, tutus, and books about princesses. 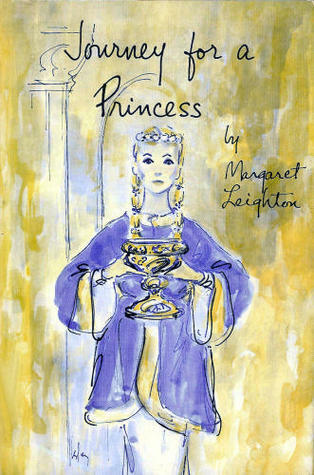 Like this classic (1960) young adult novel by Margaret Leighton. Journey for a Princess is the story of Elstrid (or Aelfthrith), youngest daughter of Alfred the Great, growing up under the shadow of her elder and more successful siblings at the Wessex court. But when a Viking noble on a diplomatic mission to Alfred's court asks for her hand in marriage, the king buys time by sending Elstrid on pilgrimage to Rome with her aunt--via Flanders, where the Countess Judith has some matrimonial plans of her own. As Elstrid's journey continues, she finds that as Alfred's daughter she has much more danger and duty to face than she ever imagined. I didn't know anything about the historical Elstrid when I began reading this book, so about halfway through I realised I had no idea how the story was going to end! I enjoyed the suspense that added to the book, and I loved seeing Elstrid's ninth-century world, from Wessex to Flanders to Rome, through her eyes. I don't know what Margaret Leighton was like as a scholar, but she certainly showed a detailed familiarity with the people, places, and everyday life of Western Europe at the time, which makes the story very vivid and immersive. On the other hand, I thought the first half of the book was a little slack. This pays off in the final quarter, which is a really fun (though probably not historically accurate) blend of romance and adventure as open rivalry breaks out for Elstrid's hand and the alliance with Wessex. I'd also note a reservation about the worldview of the story, which is pretty pro-Rome--Elstrid and her aunt accompany the payment of the Peter's Pence tax from Wessex to Rome, which is seen as an unequivocally good and proper thing in the story, for example. No doubt that's a historically accurate attitude for the characters to have, but it wasn't one that was widespread at the time (the rest of Europe wasn't paying Peter's Pence at that point) and I thought this and other elements betrayed the author's pro-Roman perspective. Protestant readers will probably want to look out for that. Otherwise, there was lots to love in this story. Like much young adult fiction, this is a story about a girl reaching adulthood, with the responsibilities and new experiences that come with growing up. Unlike a lot of YA, however, Journey for a Princess is about living up to real standards of maturity, rather than asserting a right to immaturity. Elstrid's journey requires her to take more and more responsibility for more and more areas of her life. As a princess in ninth-century Europe, she must learn that her foolish decisions may cost lives--and that the wise choice she doesn't want to make may carry its own happiness with it. Journey for a Princess is not just a vivid look at a little-known period of European history; it's also an inspiring picture of faithful and feminine strength. It's good enough to be a rewarding read at any age, but I would particularly recommend it for girls between 8 and 15. Sadly, Journey for a Princess is currently out of print, but it is available on the Open Library. There was a time when I tried to like Daphne du Maurier's books. In my late teens I read The King's General, but it left me with a sour taste in my mouth and a sense of moral outrage. Then I read Frenchman's Creek, with its delicious premise - pirate romance on the Cornish coast - and was once again repulsed; I could find no sympathy with the romance, since the main character was married to someone else. By that point I really should have known, but I went and read Rule Britannia anyway, since it seemed a fun alternate-universe romp about one clever woman leading a resistance against an invasion of Britain. And I actually don't remember anything about that book except hating it in a bored sort of way. So, realising that Daphne du Maurier and I did not get on, I simply didn't read anymore. Not till this year, when a friend started raving about Rebecca. Oddly enough, I'd often heard of Rebecca as being du Maurier's magnumopus, and I'd occasionally toyed with the idea of reading it. A gothic romance (I love gothic romances) with a famous twist (I like a good plot twist), Rebecca seemed to have sunk into the cultural consciousness. Maybe du Maurier had written one worthwhile book. And after all, it was years since I'd touched her work. Maybe, now that I was older, I'd appreciate it more. So I decided I'd read Rebecca. The first thing that surprised me about the book was how rich and evocative the writing was, and how rather unabashedly romantic and suspenseful it was in a mid-century way. Young, shy, and awkward, our first-person narrator meets the older and more sophisticated Maxim de Winter during a holiday on the Continent--and to everyone's surprise, is swept off her feet. Before she knows it, our heroine is Mrs de Winter. The second Mrs de Winter. Maxim takes his wife home to Manderly--the beautiful, overgrown estate on England's south coast where he once lived with his first wife, Rebecca. Though Rebecca is dead--lost in an accident at sea--the new Mrs de Winter feels overshadowed and oppressed by her memory. Servants, faithful to the previous mistress, who take every opportunity to maker her feel inferior. Rooms and schedules that Rebecca arranged. The neighbours and family who leave her in no doubt about Rebecca's beauty, charm, vivacity, and capability. Can our shy and awkward heroine ever hope to fill Rebecca's shoes? Is Maxim too much in love with his first wife to make a place in his heart for his second? Or does Manderly conceal a much darker secret than the second Mrs de Winter can guess? In some ways this was a brilliant novel. The atmosphere of brooding suspense, the hot, almost jungle-like atmosphere of Manderly, the slowly building mystery, the aching romance, the shocking twists and turns in the second half of the plot--this novel, despite its lit-fic pretensions, does the gothic/romantic suspense thing tremendously well, straddling the transition from Charlotte Bronte to Mary Stewart in one unforgettable story. Rebecca's literary pretensions were evident in the narrator's stream-of-consciousness style (which I thought worked very well to weave an atmosphere of suspense) and the rather slower, meanderingly-plotted, character-driven first half of the novel, as well as the ending, which (depending on how you look at it) might range from bittersweet to sombre to downright tragic. I thought all of these choices worked very well in the story; it was a little more than just another romantic potboiler with a neat happy ending. In other words, I would have really enjoyed this novel. If it wasn't for one thing. The shocking plot twist comes at about the three-quarter mark, when we learn the big secret that Manderly has been hiding. 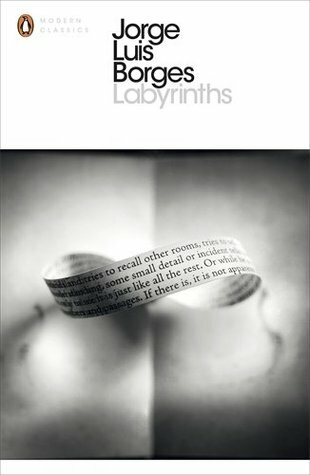 Like everything else in this book, it's a very well-done twist: you never expect it, but all the clues are definitely there. Sadly, though, this twist falls into the pitfall of originality: to be perfectly blunt, it's shocking because of its amorality, not because of its cleverness. 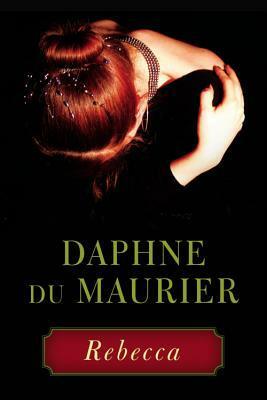 Reading the last quarter of Rebecca, I was once again reminded why Daphne du Maurier has always so repulsed me. Her amorality--perhaps a better term would be immorality--crops up in all the novels of hers I've read, and it's no surprise to see it cropping up in her own life as well. After a superficial look at her personal life, the reader would be pardoned for wondering if the three most prominent women in Rebecca--both Mrs de Winters and the ominous housekeeper Mrs Danvers--with their jealousy, obsession, and secrets--may have all been autobiographical to some degree. So, in the end, I have to shelve Rebecca with all the other morally repugnant Daphne du Maurier books I've ever read. I know this won't be popular with some readers, especially those who loved the book. I want to be honest with you--I think it's brilliant, and I think a mature and tough Christian could read it for the good art with little ill effect. But it's foolish to believe that that a book this brilliant, this memorable and moving, will leave no impression on the reader. Daphne du Maurier's Rebecca is an immersive, magnificently atmospheric apologia for moral relativism. But I don't recommend it. If it doesn't offend you deeply, you aren't ready to read it. And if it does, you won't enjoy it.